We want to keep giving you a great product…Here’s our very latest features and updates. ResNova is a customisable booking plugin that feeds your availability from ResRequest to your website. We’ve developed two versions of ResNova – one for a standard HTML website and a second plugin for our WordPress fans. Here’s what ResNova looks like..
Our early adopters Great Plains are innovators from saving rhinos to new technology. They quickly asked to be first in line to test drive our plugin on their WordPress site. We love how their site integrates the plugin and matches their stunning branding. If you’d like to use our plugin the next step is to contact us and sign up as a beta user. We’ll do all the back end stuff and then we’ll point your web designer to our plugin setups. And there’s more in the pipeline..
ResNova currently supports credit card payments through PayGate SA and we’re planning to add more vendors to this list. We are also aiming to release a version of ResNova that supports multiple ResRequest customers so you can easily display your neighbour’s availability with yours to make booking circuits super easy for the trade. To show this new picture carousel just upload photos of your property and rooms from your online ResRequest server and you’ll get some great visuals on your calendar. These photos are also available through our API so if you’re using ResNova or designing your own booking page for online bookings, you can grab these pictures from ResRequest. In the pipeline… We’re planning to add a Google map with your lodge co-ordinates to make it even easier for the trade to book their circuits with you. Sometimes you need to understand what time your team made changes when you’re in a totally different timezone to them. To help you do that we’ve implemented a timezone-toggle that let’s you change ResRequest’s audit trails to your timezone, or your team’s timezone. We added this for you to help you work with ResRequest and not worry about counting out the 24 hour clock after battling the red eye flight. Here’s how to use it. Look for the clock on your shortcut bar. Click that and you’ll see the timezone you’re set up with. 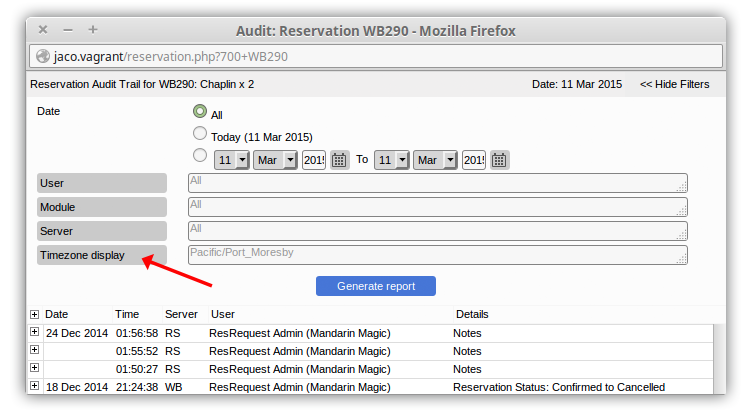 You’ll also find the timezone clock in your important audit screens so you can toggle time, anytime! Sometimes someone in marketing comes up with a great idea, “A rate discount to incentivise travel”. It could be discounting the last night of stay, or discounting one itinerary leg when the booking travels across properties. So idea in hand, the marketing team call a meeting and enthusiastically tell their reservation’s team about their special rate, but they’re met with blank stares. We understand the blank stares because we know how much work changing rates can be. That was – until our new Special-rates module was released. To help your marketing team get the smiles they deserve we’ve created a Specials modules to easily apply discounted pricing. Now you can create specials, automatically apply them to bookings and check how your special’s performing. Setup your specials using discount combinations based on pax, number of rooms and more. The option to add a special even pops up when you’re making a booking (top) or you can go back and add it to an existing booking (bottom). Your system administrator can also sleep easy at night because we’ve made sure that it’s all access controlled. If you’re running big pre-booked group bookings and you offer package deals, then block bookings is the ideal feature to manage your availability. Block bookings let you create and save itineraries that can be repeated and linked to one or many agents. If you don’t use them – we’ve got that sorted – they’ll expire just like a provisional booking. If management want to know how your blocks are performing – just point them to our simple ‘Allocation’ reports.